Western Science is the great producer and indicator of progress and development. Hardly a life has been unaffected by western science in the 20th and 21st centuries as we become more reliant on science in our work, and in our leisure. There is an expectation of finding a technological fix for most problems. Western science has a long history from Pythagoras to Newton, but has grown rapidly for at least the last 300 years. This growth is paralleled by European expansion around the world. Imperialism has devastating effects on Indigenous peoples the world over, and science is often used to ‘prove’ western superiority over ‘primitive’ Aboriginal groups. This justified in the eyes of white invaders the conquering of Aboriginal people, resulting in the breaking down of traditional social, political and economic structure: cultural and physical genocide. This process is relevant to all branches of science, from physics and medicine, to the relatively new sciences of anthropology and archaeology. Scientists’ involvement in colonial processes has tended to be obscured through the establishment of a perceived exclusive and elite realm of ‘scientific’ endeavour. This is alleged to operate outside the influences of Christianity and broader social attitudes, employing the language of ‘rational thought’. This claim to rationality stems from liberal thought, which also claims objectivity. It asserts that science is free of biases of race or colour. If there was cultural resistance to the notion of an imperial mission, there was not much support for that resistance in the main departments of cultural thought. Liberal though he was, John Stuart Mill… could say, ‘The sacred duties which civilised nations owe to the independence and nationality of each other, are not binding towards those to whom nationality and independence are certain evil, or at best a questionable good’… Almost all colonial schemes begin with the assumption of native backwardness and general inadequacy to be independent, ‘equal’, and fit (Said, 1994: 96). The development of western scientific thought and social institutions have as a foundation, the assumptions of traditional liberalism because they are developed within the context of a liberal democracy. By implication these scientific epistemologies and institutions also inherit a legacy of racism and oppression. Therefore, the notion that science and scientists are objective and free from the constraints and values of broader society is false. Science is a socially constructed discipline and therefore inherently based around the attitudes and desires of the broader community. 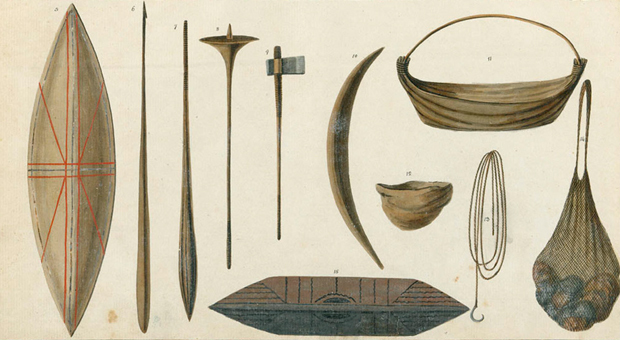 For a society bent on the dispossession and control of the Aboriginal inhabitants, anthropology served as an eminently ‘practical’ discipline. It did not challenge prevailing attitudes as confirm and legitimate beliefs… Social anthropologists inherited a belief in black inferiority so powerful as to determine their whole methodology (Glover, 1999). For the first people of the Sydney region, European contact proved to be particularly devastating. Captain James Cook’s voyage of 1770 and the First Fleet’s arrival in 1788 introduced many scientists, including botanists and medical men, to the local community. 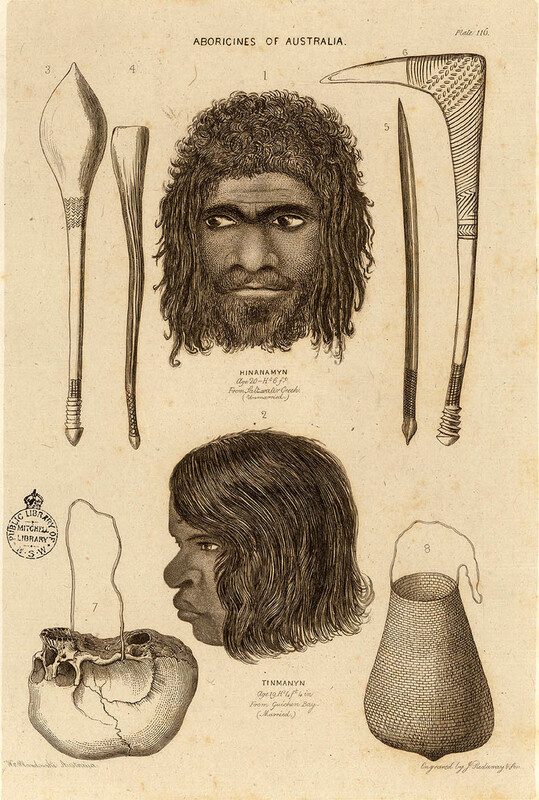 Sydney’s Aboriginal people were the first Indigenous Australians to be subjected to the full scrutiny of the white European gaze and to scientific analysis. The colour of the skin, the nature of her hair, the proportion of the body, of this woman, perfectly resembled that of the other savages of New Holland, … She was uncommonly lean and scraggy, and her breasts hung down almost to her thighs (Peron, 1809, 1975). Aboriginal men were often described as being less masculine than white men, in that they were allegedly not as strong, nor as well-endowed. 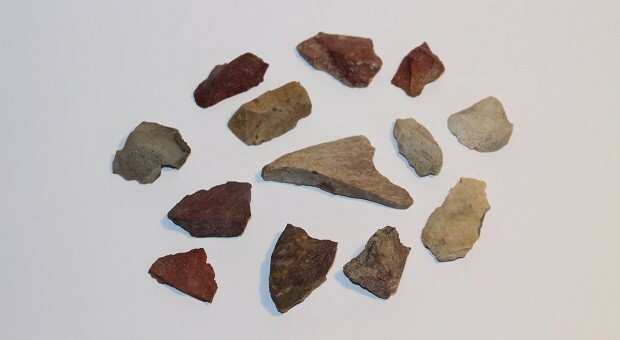 This was inconsistent with other early journal observations of the Aboriginal body as being very athletic, agile and quick, good climbers, powerful swimmers, and tireless travellers. This level of fitness was such that it could cause anxiety in the beholder (Konishi, 1998: 32). They walked stoutly, appeared but little fatigued, and maintained their spirits admirably, laughing to excess when any of us either tripped or stumbled, misfortunes which much seldomer fell to their lot than ours (Tench in Flannery). The diet which sustained the Aboriginal body was explicitly described, though again through a veil of western horror. 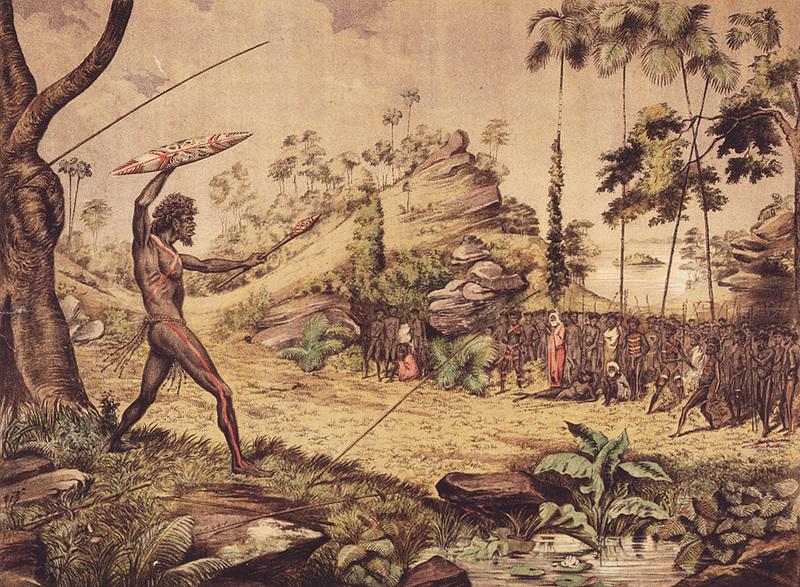 It was assumed that, because the Europeans were unable to find sufficient food and water, the Aboriginal people must subsist off what they scavenged. However, this assumption is contradicted by explorers’ accounts of meeting Aboriginal people who were well fed. Many accounts record them eating fish and shellfish, and there are also some descriptions of vegetables and nuts (Konishi, 1998: 33). 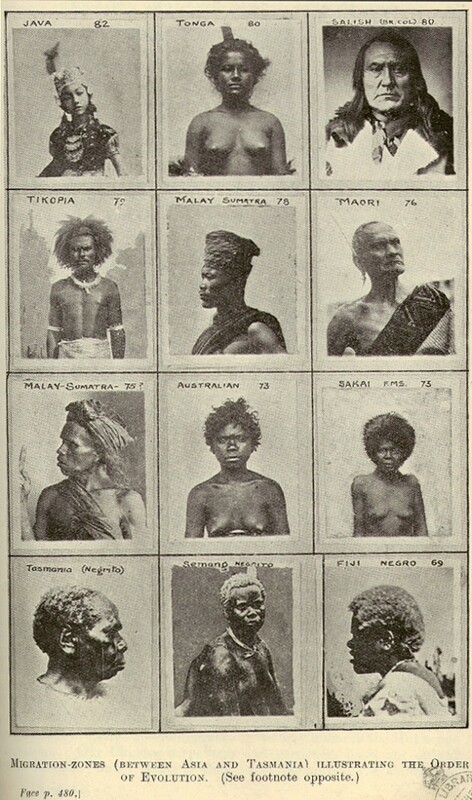 The dominant scientific discourse which informed these descriptions of Aboriginal peoples in the 19th century was ‘The Great Chain of Being’ which arranged all living things in a hierarchy, beginning with the simplest creatures, ascending through the primates to man. From the 17th century onwards it was the practice to distinguish between different types of man, with Europeans at the top of the chain. Such ideas were widely disseminated in the Australian colonies. 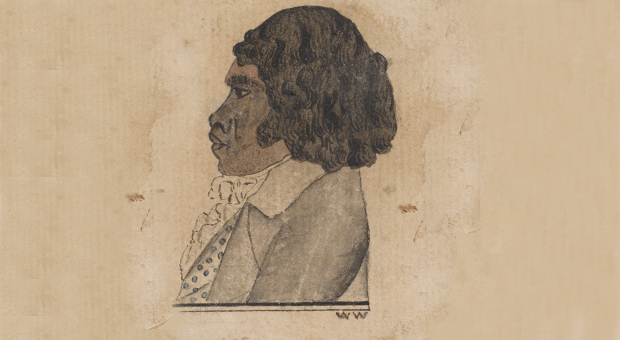 Most colonists placed Aboriginal and Torres Strait Islander peoples on the lowest link in the chain, as evidenced in this statement by W C Wentworth, commenting on the Aborigines Evidence Bill in 1844: ‘… [it would be] quite as defensible to receive as evidence in a Court of Justice the chatterings of the ourang-outang as of this savage race’ (in Reynolds, 1974: 46). …at no stage did Aboriginal civilisation develop substantial buildings, roadways or even a wheeled cart… I would strongly make the point that rightly or wrongly dispossession of Aboriginal civilisation was always going to happen (Fisher in Birch, 1995: 33). 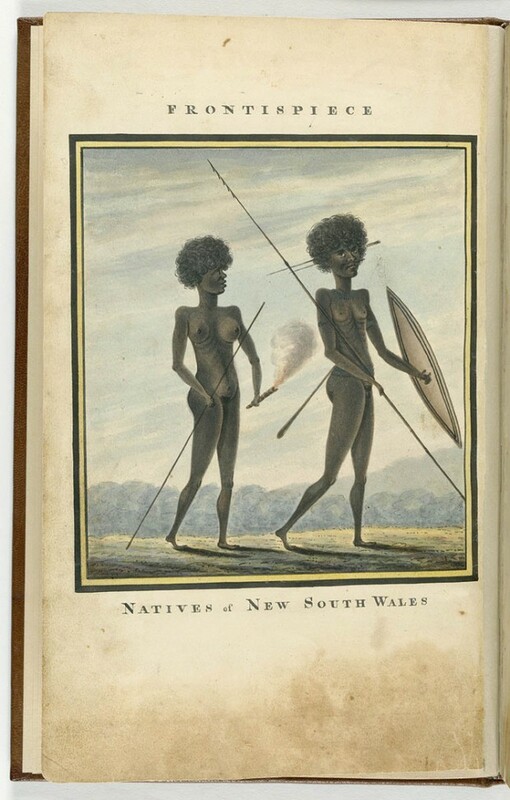 These attitudes had of course more immediate and direct consequences for Sydney’s Aboriginal population, being the first Indigenous Australians to have full contact with the invaders. Sydney’s Aboriginal people were the first to be dispossessed, to have their language and traditional practices banned, to be rounded` up onto missions and to have their children taken away. However, contrary to western scientific beliefs, Sydney’s Aboriginal people farmed the waters of Sydney Harbour and surrounding rivers, and maintained kangaroo feeding grounds, such as those near today’s Victoria Park near the University of Sydney. 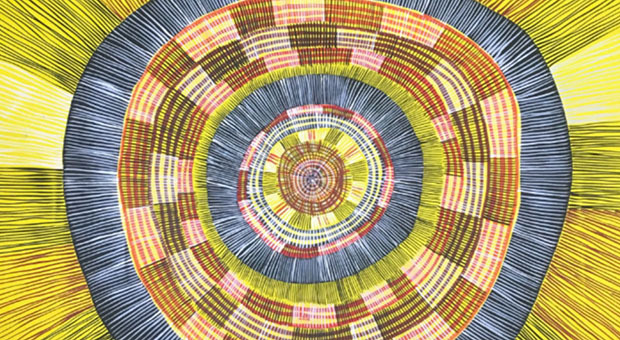 The Gadigal people traded with other Aboriginal groups and maintained religious, social and political systems, which included complex cosmological and botanical information. And Sydney Aboriginal people did not die out despite the predictions of Darwinists, as evidenced by the strong and proud descendants still living and working in the Sydney area. Birch, Tony, ‘A Mabo Blood Test’ in The Australian Journal of Anthropology, 1995, Vol. 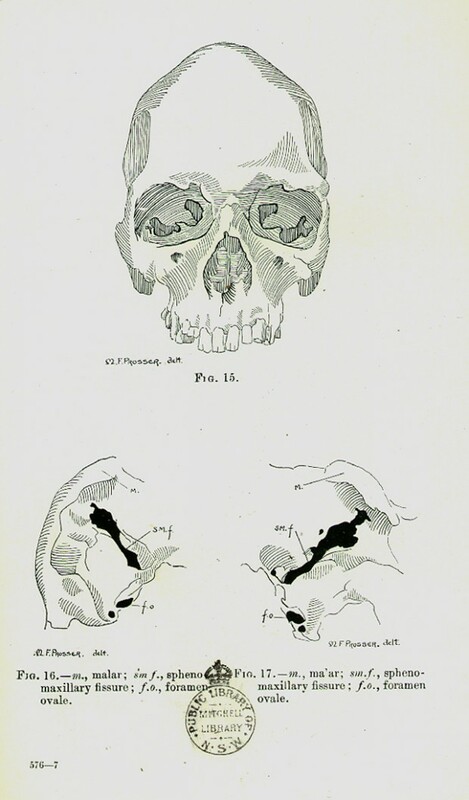 6, No 1 and 2, pp 32-42. Konishi, Shino, ‘Mapping the Metamorphosed Body: A Case Study in Aboriginal Health’ in Black on Black, Vol. 1, 1998, pp. 29-38. Reynolds, Henry, ‘Racial Thought in Early Colonial Australia’, in Australian Journal of Politics and History, Vol. 20, no.1 1974, pp. 45-53. Péron, François & Marsh Walsh Publishing 1975, A voyage of discovery to the southern hemisphere: performed by order of the Emperor Napoleon during the years 1801,1802, 1803 and 1804, Marsh Walsh, North Melbourne, Vic. Said, Edward W 1994, Culture and imperialism, Vintage, London. Tench, Watkin & Flannery, Tim (ed.) 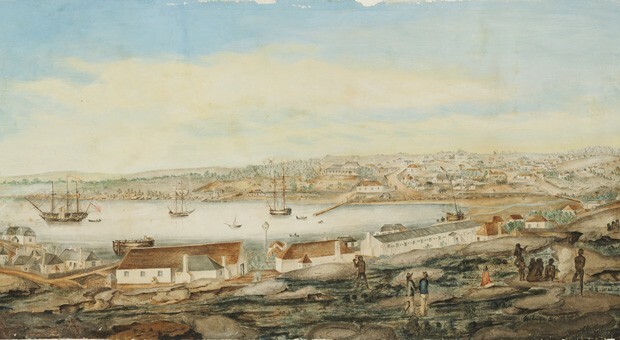 1996, 1788: comprising a narrative of the expedition to Botany Bay and A complete account of the settlement at Port Jackson, Text Publishing, Melbourne.